The 12-year-old Holsteiner mare Carella (Clearway – Lafra x Concerto II), carried Niklas Kreig (22) to his first World Cup victory during the Leipzig CSI-W in Germany over the weekend. 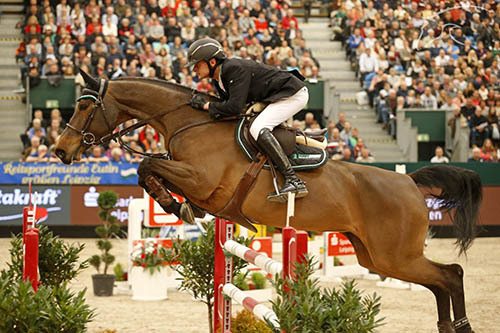 The pair finished ahead of Ireland’s Denis Lynch riding the Hanoverian stallion All Star (Argentinus – April Love ZH x Almé), while 12-year-old stallion Don VHP Z/ex Don van het Parelshof Z (Diamant Semilly – Sara van het Parelshof x Voltaire) and Eldorado van het Vijverhof (Thunder van de Zuuthoeve – Andora van het Vijverhof x Omar) finished third and fourth, respectively, under the saddles of Belgians Harrie Smoulders and Gregory Wathelet. Catherine de Buyl: When breeding magic happens!